Vegetarians, now is the time to look away. In fact, leave. Just go. Come back tomorrow, or perhaps the day after. Well, you can’t say I didn’t warn you. As we’ve been getting more and more comfortable in the kitchen, and more apt at flexing our culinary muscles, Neil and I have been looking for greater food and recipe challenges to undertake. One thing we don’t get to do very often are recipes that make enough food to feed small armies. They’re expensive, and require either a small army to feed, or being okay with wasting a HUGE amount of food (we are in possession of neither a small army nor any comfort with tossing out food). But, by hosting Christmas Dinner for both our families, we had a great excuse to cook a giant meal, with the added bonus of feeding it to people very unlikely to sue if we gave them all food poisoning (we didn’t). So we embarked upon that unholy abomination against barnyard fowl everywhere, scourge of the vegetarian and patron saint of the Church of John Madden: The Mighty Turducken! After searching far and wide for a recipe that looked like it would be achievable and tasty, we finally settled on this one from The Black Table. This particular recipe follows the standard Turkey-Duck-Chicken recipe, and uses three different stuffings between the layers, and a healthy dose of traditional Cajun seasoning. It was certainly expensive (our butcher will sell them pre-made for $175 – we didn’t come in much below that, thanks mostly to using organic, free-range poultry and much bigger birds than they claim to), and somewhat time-consuming (the work has to be spread over two days – eating the same day would be nearly impossible). But, for anyone who’s comfortable in the kitchen, it wasn’t actually all that difficult. The hardest part was boning the birds. 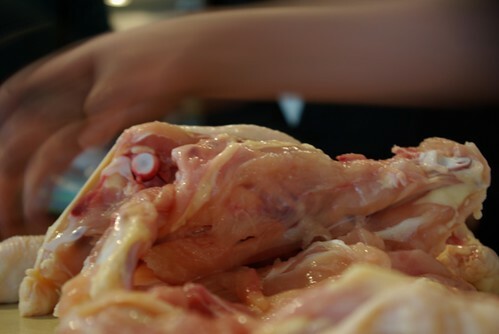 Luckily for us, my inlaws took a poultry boning workshop last year, and handily took care of removing the bones from the chicken, duck and turkey for us. Bonus: since the duck and chicken are on the inside, there isn’t a whole lot of worry about wrecking the skin. They were quite quick. The turkey was a bit more of a delicate job, and we left the drumsticks on so it still looked like a turkey, instead of a dimply loaf. The other task for day 1 was making the stuffings. If you’ve never made a stuffing (aside from Stovetop, which was actually the 3rd stuffing used for this recipe) they’re awfully simple. Sautee aromatics (celery, onions) and any other vegetables or meats you may be using until cooked through and tender. Mix with breadcrumbs, add dried fruits and/or nuts if using. Pour on broth, stir together, bake. It’s that easy. As indicated by the recipe, we did a Sausage & Oyster stuffing, a Cornbread Pecan stuffing, and Stovetop. 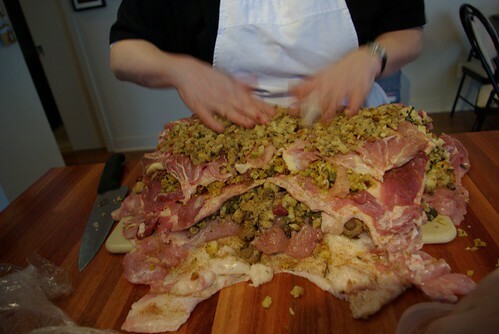 Again, we were less worried about making the stuffings than we were about putting the whole thing together. We needen’t have been. Because the birds handily have no more bones, the assembly is quite a bit different than you might think. The typical description is “a turkey stuffed with a duck stuffed with a chicken” – but while the birds are indeed inside each other, there is no “stuffing” motion at all. It’s more of a big, meaty jellyroll. This is also the part where a bunch of other hands come in very… well… handy. 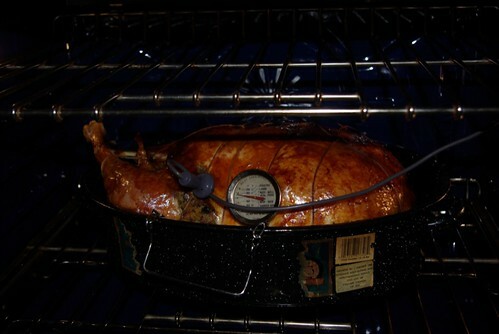 Coming at it from either side, you pull up the sides of the turkey until the meat is once again joined at the back. It all went really easily, we didn’t have to force it together at all, but we did need to hold it very securely (hence using many hands) while it was skewered down the back, then trussed up to hold it all together while it roasted. And roast it did, for five long hours. We kept it covered for the first couple hours, then took the foil off to crisp up the skin. One thing we certainly weren’t expecting was the amount of drippings this creation put out! Six full cups of juices came out of the turducken over the course of cooking it. We had to siphon most of those off into a separate vessel at every basting, otherwise the roasting pan would’ve overflowed. And it made The. Best. Gravy. I have ever had. Ever. Period. The End. I could just stop now. And I’m drooling. Literally. The gravy alone is enough reason for me to make turducken again. Also, the fact that it turned out to be really, really tasty. Even for leftovers. Which is good, because for the 14 of us for dinner, we managed to eat not quite half. 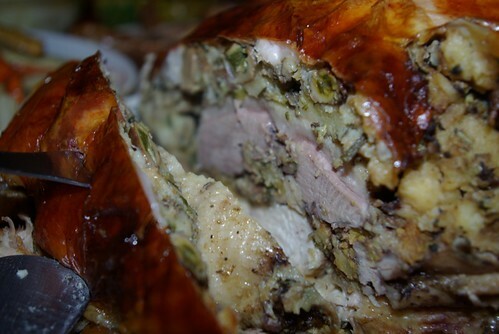 When you serve turducken, you slide a cross-section, like a big ol’ loaf (which it really is), so you can “taste the rainbow” with a portion of each of the meats and the stuffings. Most people only made it through half a slice. Knowing what I know now, this is something I’ll absolutely attempt again. I would tweak a couple of the stuffing recipes (use half of the smoked oysters, and chop them rather than leave them whole, also dice the mushrooms for the cornbread stuffing, and nix the stovetop all together for a homemade basic bread stuffing). That looks totally fun and awesome and I will definitely try it someday. Thanks for making it seem less impossible! Love the idea of a smaller scale format too.